Brody McDonald, who directs the a cappella ensemble ETHOS at Wright State, and Deke Sharon, vocal producer of The Sing-Off, will organize a contemporary a cappella camp on campus this summer. The vocal producer of the popular reality TV competition The Sing-Off will lead a contemporary a cappella singing camp at Wright State University this summer. Camp Acappella will offer two sessions during the summer of 2014: an adult, collegiate and professional camp on June 17–22 and a camp for high school students June 23–28. Registration is now open at campacappella.com. The camp is also accepting applications for faculty and camp counselors. College students who teach at the camp may earn up to three credit hours. Founded in 2013, Camp Acappella is organized by Deke Sharon, known as a pioneer of contemporary a cappella style, and music educator Brody McDonald. The camp’s faculty also includes music educators, choral directors, successful composers and arrangers and award-winning singers. Sharon is the vocal producer of The Sing-Off and music director and arranger for the film Pitch Perfect. He founded the House Jacks A cappella group and the Contemporary A Cappella Society. A prolific arranger, Sharon has produced dozens of award-winning a cappella albums, created a cappella groups for Disneyland and Disneyworld, and frequently tours the world teaching students and professional singers. McDonald teaches a cappella singing at Wright State, where he directs the student A cappella ensemble ETHOS. He serves as vice president of the A Cappella Education Association and is author of A Cappella Pop: A Comprehensive Guide to Contemporary A Cappella Singing. McDonald is also director of choirs at Kettering Fairmont High School in Dayton. He manages Eleventh Hour, an A cappella group that competed on The Sing-Off’s second season and has performed with international artists Kenny Rogers, LeAnn Rimes and Rockapella. McDonald described the camp as the biggest of its kind in the nation. 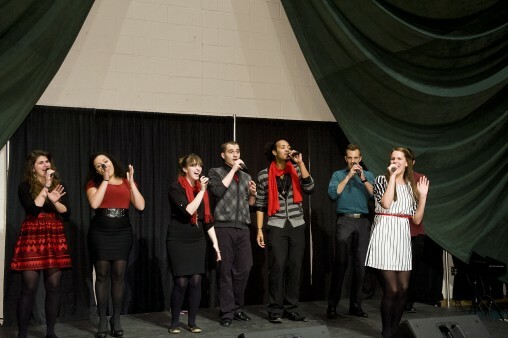 “Wright State is a leader in choral and vocal music at the university level and one of the few colleges that offers a cappella singing in its curriculum,” said Hank Dahlman, music professor and director the Ohio Center of Excellence in Collaborative Education, Leadership and Innovation in the Arts (CELIA). More information on the camp is available at campacappella.com or by contacting campacappella@gmail.com.